A new challenge blog, Color Me Beautiful!, started up last Friday so I thought I'd check it out and see if it would be something I might find interesting. Oh yeah! It's going to be a fun one and I'm definitely going to try to follow it weekly. And, they picked some of my favorite colors for the very first challenge. I wanted to try to use all five of the colors. It was a challenge to figure out just how much of what color to use and where to use it. Here is the card I designed using all of the colors. The photo does not do justice to the card. Lately my photos have not be all that good. I'm blaming the camera and going to ask for a new one for Christmas. To see the inspiration for their color choices, click the following, Color Me Beautiful! It will take you right to the blog and you, too, may want to accept their challenges. Yesterday was unexpectedly child-free, so not only did I get my challenge card made, I finished my swap cards and had a chance to spend some time with my upline, Andrea. I always enjoy time with her. Cute little flowers! I love how you folded them up a little bit. Thanks for playing along at CMB this week! 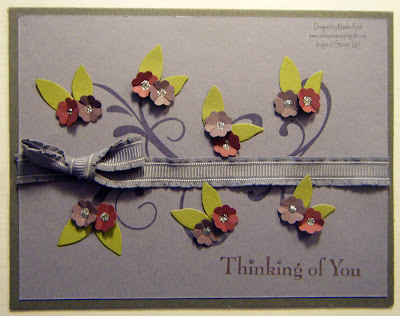 Great creation Marsha & way to go for using all the colors....FABULOUS card! Thanks so much for playing with us @ Color Me Beautiful!!! Thanks Shana and Jackie! I'm looking forward to participating in more of CMB challenges. It's challenges like this that get me to think outside the box where color is concerned. Oh, I love those dainty little flowers on the flourish! Way to go using all of the colors on such a pretty card! As far as the picture, always blame the camera! Especially if you're wishing for a new one!! Thanks so much for joining us at Color Me Beautiful! 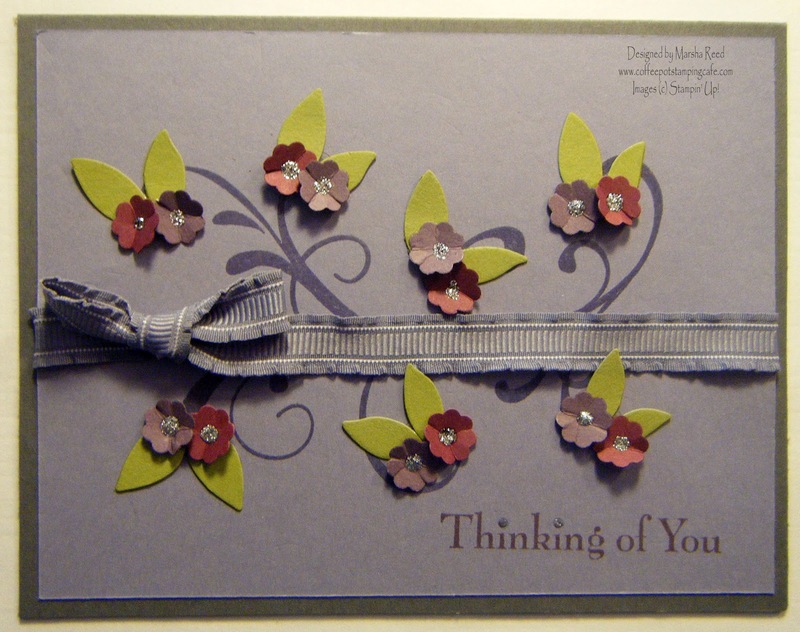 Great card Marsha, love your delicate flowers and leaves! Thanks for playing along with our very first challenge at Color Me Beautiful. Thank you Margaret and Kerry. I have a thing for flowers right now. Love the punched flowers for embellishments. You did a great job on the color challenge. I'm looking forward to more submissions from you. Great card....love swirls! This is a great way to use them. Thank you Dorlene and Leslie. The challenge was fun and I'm looking forward to the next one. This is the first time I have been to your blog...you had me at COFFEE! Thanks, Connie. I love our Dazzling Details. Makes it easy to add sparkle and I love sparkle. I'm a coffee lover, for sure.